Recently I was browsing the local drug store, checking out their Halloween candy selection to see what was new and updated for the season, when I hit pay dirt in the form of 3 Musketeers Fall Mini Mix. The Fall mix contains three flavors: Mocha Cappucino, French Vanilla, and Strawberry. I already covered Mocha and French Vanilla, so go read that and come back. I’ll wait. Back to the new addition of the bunch, Strawberry. This flavor is AMAZING. It is seriously the best new candy I’ve had in a long time. It has the same texture as a regular 3 Musketeers, but with a strong strawberry flavoring to it. It does taste slightly artificial, as opposed to a realistic strawberry taste, but I don’t mind one bit. I love this candy. So much so, that it is the first candy that I’m marking down as an Awesomely Addictive selection! Unfortunately, just like the Mocha and French Vanilla varieties, I can only find these in mini size. With the recent release of the full size 3 Musketeers Mint bar, however, I’ll keep hoping. These are likely Limited Edition, even though they’re not listed as such. So get out there and get some if you love strawberry flavor like me. I’ve been trying to find these since I saw them reviewed somewhere else. Can you tell us what drugstore chain you found them in? I bet these are AWESOME!! I would love to try some! Thanks for the heads up! Jen- I bought them at Walgreen’s. When introduced in 1932, 3 Musketeers had three pieces of candy in one package, flavored vanilla, chocolate and strawberry, hence the name. In 1945 the candy bar was switched to a single vanilla flavored bar with two shallow scores. It was marketed as the candy bar that was so big it could be shared with two friends. But after sugar was rationed in WW2 they decided to eliminate the Strawberry and before going into production they also decide that leaving two of the flavors just didn’t seem right and went into production with the one flavor option that lead to today variations we know. It’s nice to see they brought back an original!!!!! I just finished my take-out dinner and the guy at Noodles threw in some treats for me. The strawberry mini 3 musketeers being one of them. the candy is awsome ! I’ve had these, they are great. I really would like to see this be a regular full size offering. I didn’t care too much for the mocha so I don’t want to spend a lot on the mix just to get the strawberry. 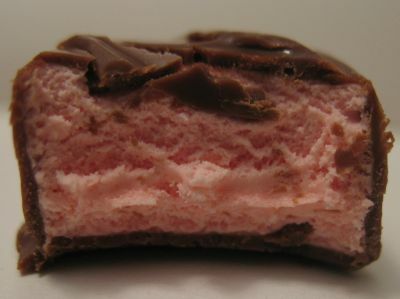 Realize this is an old posting, but strawberry was one of the original flavors of this candy bar when it was introduced in 1932. Each package contained three pieces of candy (hence the name) with each piece being a different flavor: chocolate, vanilla, and strawberry. Wow, that sounds good, but good enough to be awesomely addictive? I am addicted to the dark-chocolate cherry 3 Musketeers they’ve released the last two Valentine’s holidays, but wish they would bring back the french vanilla ones. Those were SO good. The closest I’ve found is the nougat in Milky Way Midnight.